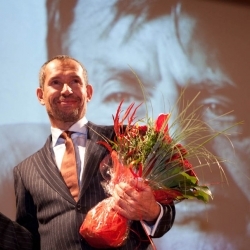 The Olof Palme Prize 2009 is awarded to the Danish writer and debater Carsten Jensen. In a time when solidarity and compassion are under pressure, the need for brave, engaged and determined defenders of human rights is greater than ever. As a successful writer, Carsten Jensen has also been an uncompromising and knowledgeable defender of every individual’s equal worth. In words and in actions, he has stood up for the weak and the vulnerable in his own society and around the world. Carsten Jensen’s solidarity with the persecuted and oppressed has brought him to the war-torn Balkans, Burma and Afghanistan, as well as to churches and public spaces in his own country, defending the human rights of asylum-seeking refugees. Carsten Jensen obliges us to think about our selfsufficiency and narrow-mindedness. He urges us to stand up for humanism, common sense and faith in our future.